This post was written by Dr Shadaab Rahemtula, one of our Religious Studies lecturers at UWTSD and organiser of the symposium. 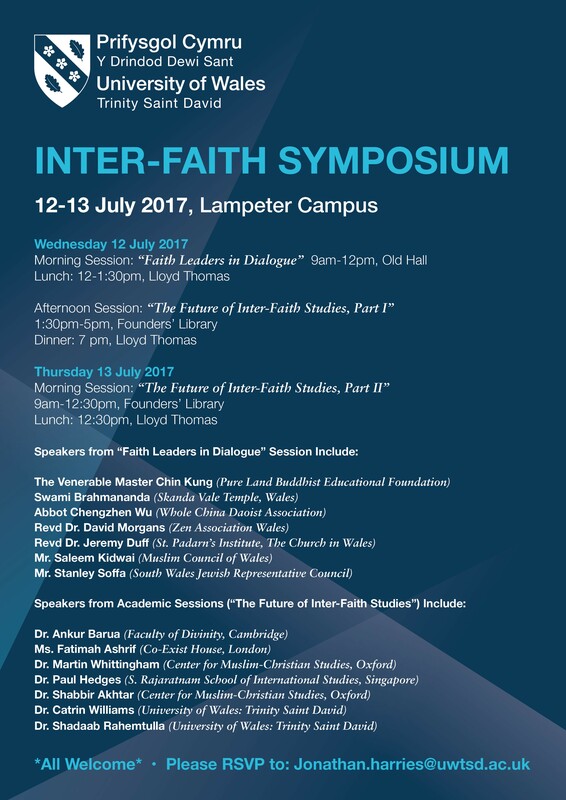 The University of Wales Trinity Saint David will be hosting an inter-faith symposium on 12-13 July in Lampeter, bringing together faith leaders and academics from across Wales and the United Kingdom. Given the turbulent political climate of our times – such as the militant attacks in Manchester and London and the rise in hate crimes against Muslims – it is crucial to open up an informed space for greater mutual understanding and dialogue between faith communities. The participants, both faith leaders and academic scholars, represent a diverse range of religions, including Hinduism, Buddhism, Zen Buddhism, Daoism, Judaism, Islam, and Christianity. The symposium will commence on the morning of 12 July with a “Faith Leaders in Dialogue” session, assembling faith leaders from across Wales. Each participant will deliver a short presentation on the potential contribution that his/her own faith tradition can make towards inter-faith engagement and dialogue. The faith leaders will include, among others: the Venerable Master Chin Kung (Pure Land Buddhist Educational Foundation), Mr. Stanley Soffa (South Wales Jewish Representative Council), and Mr. Saleem Kidwai (Muslim Council of Wales). 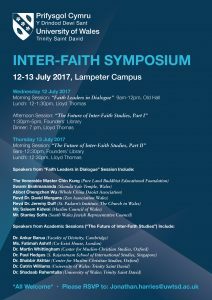 The rest of the symposium – running during the afternoon of 12 July and the morning of 13 July – is an academic session entitled, “The Future of Inter-Faith Studies”. This session will open with a keynote address by a leading inter-faith studies scholar from Singapore – Dr. Paul Hedges, Associate Professor at the S. Rajaratnam School of International Studies, and who also happens to be an alumnus of our university – followed by two panels of papers. The panelists will include, among others: Dr. Ankur Barua (Faculty of Divinity, Cambridge), Dr. Martin Whittingham (Center for Muslim-Christian Studies, Oxford) and Ms. Fatimah Ashrif (Co-Exist House, London). 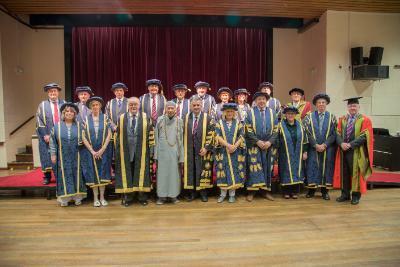 Essentially, the purpose of the academic component is (a) to reflect on the present state of the field of inter-faith studies and (b) to envisage and chart new directions in inter-faith thought and practice. What do we mean when we use terminology such as “inter-faith”, “co-existence”, and “dialogue”? Indeed, who precisely is “we”? That is, which social groups have defined the parameters of the field? In turn, which groups have been largely excluded? What areas – geographies, religious traditions, time periods, so forth – have inter-faith studies focused on and, conversely, which areas remain underexplored, even ignored? Likewise, what are the dominant methodological, theoretical, and disciplinary paradigms of the field, and how have these paradigms both enriched and limited our understanding of, and engagement with, the religious Other? How have prevailing political climates, and power relations in general, shaped inter-faith studies and the discourse of dialogue? This is just a sampling of the type of questions that we seek to tackle in this symposium. For more information, please see the poster. As the meals and refreshments are complimentary, please RSVP the names of all interested parties to Mr. Jonathan Harries (jonathan.harries@uwtsd.ac.uk). If you would like to stay in Lampeter and arrange for (very reasonably priced) university accommodation, please write to Ms. Hannah Botting (Hannah.botting@uwtsd.ac.uk). I hope you will join us in July!